UN head withdraws offer for Iran to attend Geneva 2 after Tehran refuses to support a June 2012 political transition deal. 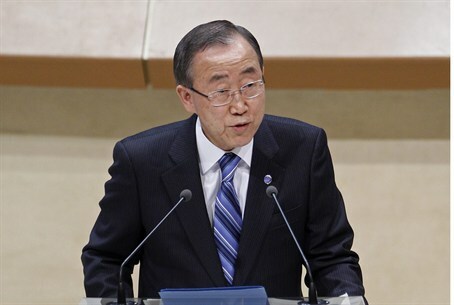 United Nations Secretary-General Ban Ki-moon announced on Monday that he had cancelled an offer for Iran to attend Syria peace negotiations after Tehran declared it does not support the June 2012 political transition deal that is the basis for the talks. "He (Ban) continues to urge Iran to join the global consensus behind the Geneva communiqué," Ban's spokesman Martin Nesirky said, according to the Reuters news agency. "Given that it has chosen to remain outside that basic understanding, (Ban) has decided that the one-day Montreux gathering will proceed without Iran's participation," added Nesirky. Ban said earlier that Iran's public statement that it did not support the 2012 Geneva deal calling for a transitional government for Syria was "not consistent" with assurances he had been given by Iran's Foreign Minister Mohammad Javad Zarif. Ban’s extending an invitation to Iran to attend the peace conference angered Syria's political opposition, which threatened on Sunday night to withdraw its attendance unless the invitation to Iran is cancelled. Iran rebuffed the precondition on Monday, saying it could not accept a plan for a Syrian political transition. "Setting such a condition to accept the Geneva 1 agreement for attending at the Geneva 2 meeting is rejected and unacceptable," the Iranian ISNA news agency quoted deputy Foreign Minister Hosein Amirabdollahian as saying. "Iran will attend the talks without any precondition based on an invitation by U.N. Secretary-General Ban Ki-moon,” he stressed. Iran's UN ambassador also said on Monday that Iran will definitely not take part if it is required to accept the June 2012 deal agreed in Geneva. "If the participation of Iran is conditioned to accept Geneva I communiqué, Iran will not participate in Geneva II conference," Ambassador Mohammad Khazaee said in a statement quoted by Reuters. Throughout the civil war in Syria, Iran has provided Assad with military support during his fight against the rebels. Former Iranian President Mahmoud Ahmadinejad personally sanctioned the dispatch of officers from the Iranian Revolutionary Guards to Syria to fight alongside Assad’s troops. The United States has in the past expressed its objection to Iran attending Geneva 2 while Russia, one of the co-organizers of the conference, supports participation by Tehran. The U.S. ambassador to the UN, Samantha Power, reiterated the American position on Monday. “As of this morning, Iran still has yet to demonstrate its willingness to explicitly and publicly subscribe to the full implementation of the Geneva communiqué. That is a minimum requirement for participation in this peace process,” she said.